Illustration of a blood clot traveling through the blood vessels until it gets stuck. A pulmonary embolism is often caused by a blood clot that forms somewhere else in the body, travels to the lungs and gets stuck there. A pulmonary embolism is a clot of material (an embolus) that blocks blood from getting to the lungs. It is usually caused by a blood clot that starts somewhere else in the body and travels to the lungs. However, it can also be caused by clumped cancer cells, fat, or bone. Rarely, while giving birth, a woman can get a clot of amniotic fluid. Symptoms of a pulmonary embolism start suddenly, as soon as the clot starts blocking blood flow to the lungs. Blood is supposed to pick up oxygen in the lungs and then carry that oxygen to the rest of the body. If blood cannot get through to the lungs, it cannot pick up oxygen or deliver it to the body. Every part of the body needs blood and oxygen to survive. Chest pain that feels like a knife sticking into the chest. The pain is often worse when the person breathes in. The worst kind of pulmonary embolism is caused by a saddle embolus. This kind of embolus blocks the pulmonary artery, which carries blood from the right side of the heart to the lungs. This makes it impossible for any blood to get through to the lungs. Since no blood can get out to the rest of the body, the person's blood pressure drops and they can go into shock. A saddle embolus is a very serious medical emergency. Many people with this type of embolus die. Oxygen. Oxygen can be given through a special mask to make it easier for the person's body to get the oxygen it needs. Anticoagulants. These are medicines commonly called "blood thinners." Doctors may give a few blood thinners together. For example, they may give heparin because it works right away. They may also give warfarin (Coumadin), which takes a few days to start working, but which the patient can keep taking at home. Thrombolytics. 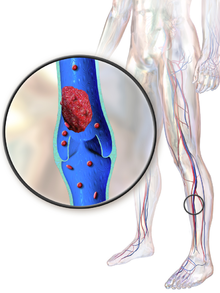 These are medicines often called "clot busters" or "clot dissolvers." They can quickly dissolve (break up) a clot. However, they are usually given only if a pulmonary embolism is life-threatening, because they can cause bleeding. Removing the clot. Sometimes a doctor will thread a catheter (a flexible tube) up through a vein and into the lung. Once the doctor finds the clot, the catheter can be used to pull the clot out, or to give medicine to dissolve the clot. In very bad cases, surgery may be needed to remove a clot. ↑ 1.0 1.1 "How is Pulmonary Embolism Treated?". www.nhlbi.nih.gov. National Heart, Lung, and Blood Institute – National Institutes of Health. July 1, 2011. Retrieved December 31, 2015. ↑ "What are the Signs and Symptoms of Pulmonary Embolism?". www.nhlbi.nih.gov. National Heart, Lung, and Blood Institute – National Institutes of Health. July 1, 2011. Retrieved December 31, 2015. ↑ Gandara, E.; Bose, G.; Erkens, P.; Rodgers, M.; Carrier, M.; Wells, P. (April 4, 2011). "Outcomes of saddle pulmonary embolism: A nested case-control study". Journal of Thrombosis and Haemostasis (International Society on Thrombosis and Haemostasis) 9 (4): 867-869. doi:10.1111/j.1538-7836.2011.04189.x. ↑ "Pulmonary Embolism – Risk Factors". www.mayoclinic.org. The Mayo Clinic. March 18, 2015. Retrieved December 31, 2015. This page was last changed on 12 February 2016, at 22:28.